The 2017-18 NHL season has had some highly erratic outcomes. Each season, the league’s lack of predictability has become ironically foreseeable. As the All-Star Break has concluded and the latter end of the campaign commences, the biggest statistical outliers thus far are analyzed below. The Vegas Golden Knights, in their first season following the expansion draft, are one of the top teams, confounding the NHL. Barring a monumental collapse, they are poised to enter the playoffs as a top seed. With a significant lead in the Central division, their strong record is a result of their complete play this season. The team is young, fast, and dominates both goals and shots in almost all strength states relative to other teams. As a result, Vegas looks like a legitimate Stanley Cup contender. Prior to the season, although a portion of individuals disapproved the notion that Vegas would finish last, fans, analysts, and front offices likewise were unable to forecast the success Vegas’ inaugural season would hold. A compelling factor contributing to Vegas’ success has been forward William Karlsson. He has 27 goals in 47 games this season. George McPhee and Vegas’ front office should be credited for perhaps seeing potential in Karlsson that many others failed to see. After being left unprotected by the Columbus Blue Jackets, Karlsson was acquired by Vegas in the 2017 Expansion Draft. It is statistically implausible for Karlsson to conclude the season within the parameters of his currently high 27% shooting percentage. However, the 25-year-old has been validated as a legitimate goal scorer. Generally, goals per game between one season and the next have remained consistent. The R-Squared is 0.56, using a sample of 404 players with at least 500 minutes of ice time in last season and this season. 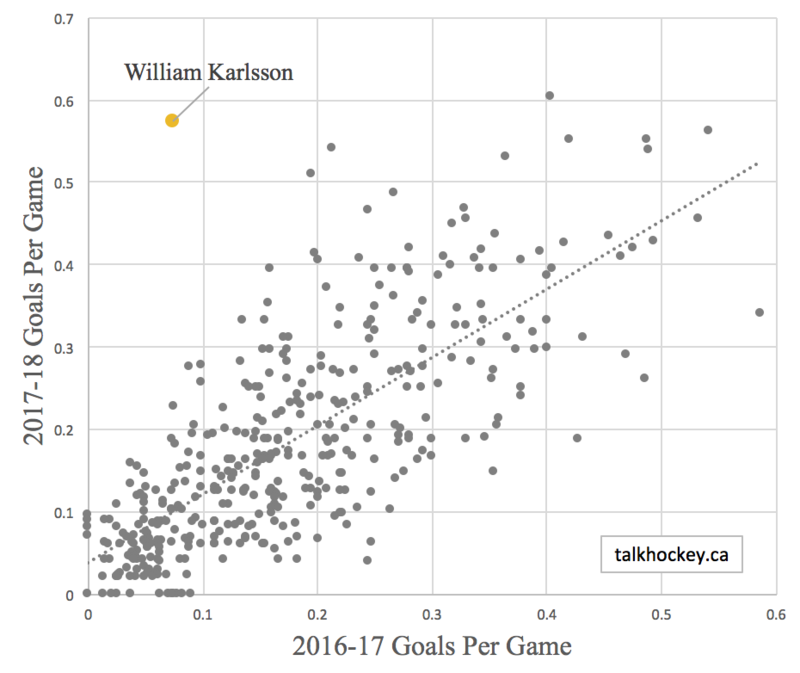 Based on the data provided, Karlsson has been a huge outlier, beating his goals per game rate from the 2016-17 season by a significant margin. When the Pittsburgh Penguins triumphed over the Nashville Predators to their second consecutive Stanley Cup despite getting outshot for the majority of the playoffs, the common sentiment amongst hockey analysts was perplexity as they pondered how much of Pittsburgh’s success was luck oriented and how much was shooting and goaltending talent. This season, matters have taken a course opposite to Pittsburgh’s commonplace. They have an expected goals percentage of 51.62% at even-strength. Yet, they have scored solely 42.11% of the actual goals. Currently, the disparity of 9.51% would rank last out of 331 seasons of team data since the 2007-08 season, including data from the Atlanta Thrashers and the 2012-13 lockout season. Regression is highly probable in the remaining part of the season. But, completing the season in a historically high percentile in terms of underperforming their expected goals is extremely likely. Considering the Penguins are in a playoff spot despite this, it is apparent that they hold potential to be “dangerous again”, as former goaltender Marc-Andre Fleury posited. They have the capacity to win their third consecutive Stanley Cup. “The luck of having talent is not enough, one must also have a talent for luck”. In the NHL, sole talent or luck is not enough. A team must attain both to succeed. This is principally true for the playoffs, in which a small sample of games is influenced by luck to a greater degree. Over a century later, in a different field, the words of Hector Berlioz apply to the NHL. 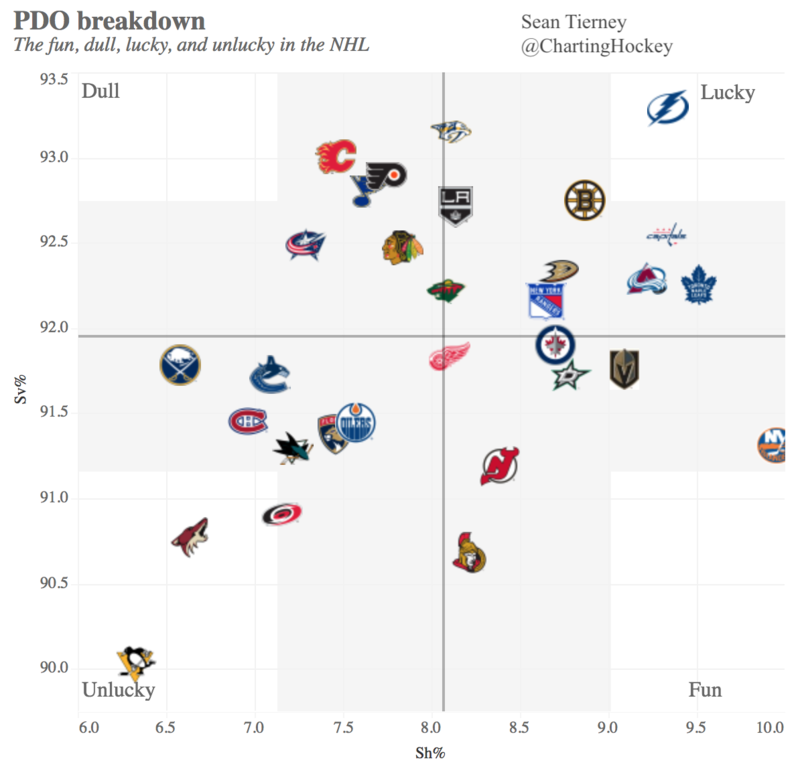 A chart by Sean Tierney exemplifies the fact that Pittsburgh is last in the NHL in both save percentage and shooting percentage at even-strength. When Alexander Ovechkin recorded 33 goals last season, several critics concluded that age was impairing arguably the best goal scorer in NHL history‘s ability to score. Throughout the 2017-18 season, Ovechkin has refuted the opinions of those dubious regarding his scoring ability, leading the NHL in goals with 30 in 49 games, putting him on pace for 50. Albeit Washington should no longer be considered as strong of a contender compared to previous seasons, they have been extremely poor in almost every shot metric and have not been plagued with significant injuries either. But, certain futures markets still seem to have inefficiently priced them, giving the team the third highest Stanley Cup odds at some points this season. General Manager Brian MacLellan still believes that a Stanley Cup is attainable. A Stanley Cup run necessitates Washington’s need for Ovechkin to continue scoring at his current pace. His shooting percentage on the season is merely two points higher than his career average. Therefore, the pace at which he is playing should be sustainable. Ovechkin has been integral to Washington for his entire tenure, but with his team currently lacking the depth it had in previous seasons, his talent is more so vital. Ovechkin has scored 20% of his team’s goals, the highest of any player in the league. Yet, his name has not been mentioned in any Hart Trophy discussions, which is awarded to the player most valuable to their team. For Ovechkin to be playing at such a high degree at the age of 32 epitomizes his exceptional career. He is distinctly defying the decline which has been common among other superstar snipers when they surpassed the age of 30. Rick Nash has 15 goals in 50 games at the age of 33. Corey Perry has only 27 goals in his last 121 games. Joe Pavelski has 10 goals this season. While Nash, Perry, and Pavelski never scored at the level that Ovechkin did during his prime, their individual drop in production has been palpable. 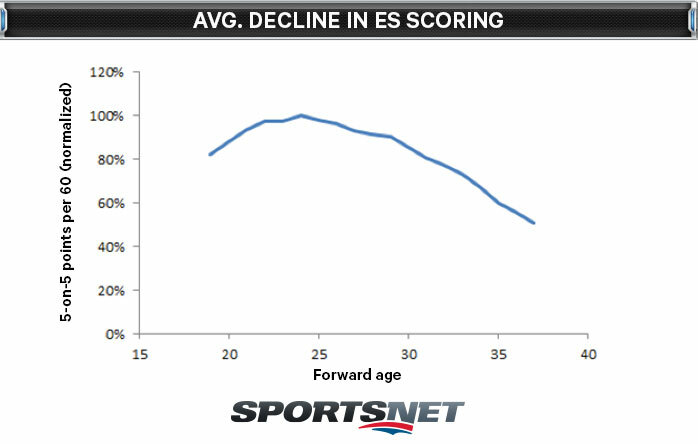 Portrayed in this graphic by Eric Tulsky, this is generally how even-strength scoring rates decline when a player ages. Ovechkin’s even strength scoring still remains very strong.